Last summer, while I was taking a walk in Northern California after reading some excerpts of “Classical Greece” by C.M. Bowra (1965, from the Time Life collection The Ages of Man), I envisioned a movie about a topic: philosophy in Pericles’ Athens. In that moment, I held the hope that such movie, or at least such script and or play, did exist in some form. After the walk, I searched for it and nothing close to what I was missing came out. I sit down and decided to brainstorm what to me would have been the most beautiful movie to watch in that moment… though there was a problem. Such movie did not exist, nor its script had been written. The “movie” played with one idea: a casual and interesting walk through 5th Century BC’s Athens as reflected in one concatenation of geniuses: Socrates, Plato, and Aristotle. The movie, then, had a working title/equation: S > P < A, where “S” (Socrates) is more important as a philosopher (and more positive to humanity) than his disciple “P” (Plato); and “P” is less important to humanity than his disciple “A” (Aristotle). I even planned to Kickstart the movie, but I sort of guessed a crowdfunding platform would look for “faster” ways of “gratification” to supporters. I was right: the project wasn’t even considered (this is something that puzzles me: before even letting users decide, there’s a team of Kickstarter “experts” -in what, exactly?- who decide whether a project makes sense or not). Mine, like many others, didn’t make sense to them. The submission was only an experiment, and Kickstarter just told me then that they just approve only 1 project per account at once almost always (those days I had submitted another puppy project, in this case the translation from Spanish into English of a book fiction trilogy, which I decided to terminate since I didn’t think I was ready to crowdfund something already finished in another language and personal). Conclusion: my views of crowdfunding are contradictory, since it’s difficult to control the process and focus on what you are intending to do, rather than doing PR all the time in order to get crowdfunded. Self-reliance in personal creative projects, on the other hand, gives the creator both freedom and real responsibility. Anyway, I thank crowdfunding for prompting me to write down at least one of the ideas that were chasing me around one year ago. Now there are others, but I don’t think I will submit them, since I have noticed the so called “review” process is obscure. Objectiveness is difficult in such an early stage and nobody can know about the potential of everything that could exist. Otherwise, creativity and talent would be easy to commoditize and would be transformed into an algorithm. The biggest opportunity for such a story could be a personal related project to begin with, something that doesn’t require neither other “funding” than personal hours nor expensive expertise from others (always helpful and enriching, but it might come or not). Say, a script, or maybe a novel. And such projects require knowledge, time, and lots of work. But there are almost no barriers to explain the basic guidelines of the story before it exists, or before it ever exists in the worst case scenario. This is the story of the three greatest intellectual superheroes of all time, and it’s never been told in a movie. In an Ancient Greece when memory of the Dark Ages was still present and rational thought was in its infancy, three men rewrote the way we understand our world. Socrates, Plato and Aristotle, three consecutive generations of thinkers, dared to believe there was another way to think and challenged their peers and thousands of succeeding generations to relate differently to the world. Aging philosopher Xenophon, peer to all three great thinkers, narrates the story as he pieces together the drama that plays out across three generations of men in a fight for rational thought and individualism by some of the most heroic free thinkers of all time. This story happens when these ideas were just a spark of defiance to the Darkness of the Unknown and Superstition: Classical Athens as the center of the Greek world by the end of the Dark Ages, represented by the Dorian Invasion. but, being a trained warrior, he is also painfully aware that the bravest of the Greek world are found in the vanguard of the Peloponnesian League, led by Spartans, who master war and fight for supremacy among the Greek poleis (plural of “polis”, city-states). and Aristotle, Plato’s alumni, who rebels against his master’s mystical ideas by vindicating Socratic thought, conceiving logic and anchoring analytical thought to Western civilization. We see the rise and consolidation of Classical Athens in the eyes of historian, soldier and mercenary Xenophon, who narrates in first person how he happened to meet the three biggest geniuses of his era, becoming the alumni of the oldest, Socrates; friending and defriending the brightest among Socrates’ disciples, Plato; and serving as friend and protector of the youngest, Aristotle. Socrates-Plato-Aristotle would be the account of the struggle to consolidate the ideas of democracy and rational thinking in Athens, when prosperity and relative peace, once the Persians have been defeated, create the scenario for the best individuals to test their potential worth. Only Spartans and the Peloponnesian League can threaten the achieved dream in Attica’s Athens, leader of the Delian League in the Peloponnesian War. and his are the last words of the story, used to pay respect to those who listened, as well as to hint that, in the battle between mystical ideas (Plato) and reason (Socrates, Aristotle), prosperity will prevail and Aristotle will shine to the brightest and bravest from the future to come. The story takes place in the rough land facing the pontus in the southernmost tip of the Balkans, the indented coastline and islands that shaped the character of its people, who lacking big rivers within wide and fertile valleys decided to cultivate their individual worth, rather than thinking that everything comes from gods and tyrants. The story begins when the Dark Ages belong to the past: Cleisthenes had established Athenian democracy in 508 BC, and Xenophon belonged to the generations who had not known another political system. Elderly Xenophon wakes up in the middle of the night after another nightmare that brings him to the Dark Ages he had not known, when a flash of thought pursues him once more: to leave account of the exceptional triad of philosophers he has met in his lifetime. It’s time to write before the last mental and physical energy dissipates, the same way the atomists explain: clusters of indivisible particles conforming new entities and dissipating old ones. Mortality. Athens, Attica. In this corner of the Mediterranean, where winds favored exploration and made external attacks more difficult, self-awareness of the individual had been born, as well as the idea of examining oneself and living a purposeful life as a means to self-realization. and observing-experimenting to verify facts and advance towards a bigger understanding of oneself, the universe (Aristotle, disciple of Plato). Before a city in that land, Athens, nurtured the environment where Socrates, Plato and Aristotle were possible in a span of under a century, the cities of that windy and hilly corner of the Mediterranean had gone through the Dark Ages, a long era where the Dorians from the North had destroyed the Mycenaean palatial culture. The physical limitations of the land and the difficult communication between narrow valleys separated by mountain ranges shaped the personality of the cities and the people, always between sea and land, between the Mediterranean triad -wheat, grapes for wine, and olive trees for oil- and the goods from the sea and commerce. Back in a time that not even rapsodians could reach, the first prosperous cities developed the belief that a man shall be respected for his own sake, attitude and abilities in the arts of living (philosophy, work), oratory, and defense. A trained mind in a trained body. Philosophies of life from classical Athens deserve a powerful movie, explaining the essence of the teaching of the three biggest philosophers, interconnected in consecutive generations, being the older the master of the younger: Socrates, Plato, Aristotle. Socrates and Aristotle taught their disciples how to inquire and know more about themselves and the world; that way they would walk towards excellence. Inquiring method (Socrates) and logic (Aristotle) would be their strongest tools to learn and reach their dreams, no matter how difficult. Because 1+1 is not always 2, as Socrates would show. And because A is A, as Aristotle would show. Plato, on the other hand, believed in the subjective power of goodness, transforming the ideas of Socrates into a rich and mystic theories, intuitive and unable to be proved by the inquiring method (therefore, not based in what modernity would call “scientific method“), at times closer to religion than to science. Classic philosophies of life would teach not only about what surrounds us and about the individual, but also would teach young pupils “how to live”, or the “art of living” (expression used later on by the Greek slave-turned-philosopher Epictetus the stoic in Rome). and rebels/achievers (philosopher Aristotle and playmaker Euripides). Socrates was master of Plato, Plato was master of Aristotle… and this last one, besides being perhaps the biggest influencer in Western thinking, left Athens to become tutor of king Philip II of Macedon son’s tutor, a boy later to become… Alexander the Great. The story takes place in the time of Pericles, Athens’ most prominent statesman, scrupulous with democracy and individual liberties; and in one location, Athens itself when Pericles promotes the biggest engineering and artistic achievements of the era, including the Parthenon and the finest sculptures ever created. 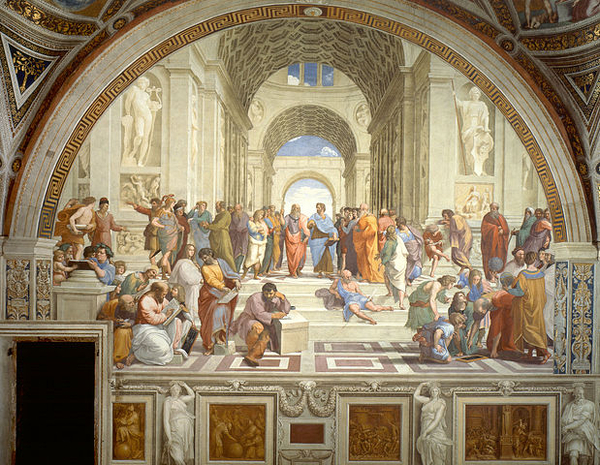 the narrative’s Present Moment: the days of Plato’s Academy: when Plato’s age of “ideas” and “mysticism” are at their peak, one of his disciples, the rebel Aristotle, opposes all theory if it’s not demonstrable as a fact, calling for direct observation and logic. Past I, Past II and Present Moment are each one generation apart. Past I and Present Moment show the similarities between Socrates and Aristotle. Past II lays out the power of disruption: Plato’s mystical world of ideas. Timeframes go back and forth as flashbacks, in a similar fashion as The Godfather II goes from what’s current time in the story to the days of Young Vito Corleone. By vindicating Socrates’ questioning method in order to advance the “truth”, Aristotle will become the founder of scientific method that nurtured Scholasticism and the first medieval universities, Renaissance, Enlightenment, Industrial Revolution or Atomic/Space Age possible. Socratic/aristotelian “eudaimonia” and “arete” (reaching happiness and excellence through reason and introspection, because knowing oneself is knowing more of others) vs. platonic and jewish-christian mysticism, misericordy and sacrifice for the others. In our story, the battle between rationals and mystics takes an oratory fashion: the young Aristotle will try to refute Plato’s biggest ideas in front of the rest of the congregates in the Academy. The intrigues, preparation and consequences of this oratory define the movie’s outcome: Aristotle assists in the success of platonic ideas and its consequences in Athens everyday life, when beliefs with no reasonable base spread populism, as well as dogmas based on subjective ideas and superstitious beliefs. The movie ends with Aristotle, exhausted of seeing how Plato’s ideas turn into an excuse to fight democracy, individual liberties and respect of law. Like a Randian character, Aristotle decides to leave town instead of giving up “eudaimonia”, logic and the powerful idea that man can be happy by working on his rational purpose. Reaching the end of the movie, the Present Moment narrative fades out in Aristotle leaving Athens. A final text explains that Aristotle would not give up: later on he would return and teach in the Lyceum. and Present Moment, when Aristotle is a rebel youngster. Present Moment: old Plato and young Aristotle. Present Moment: old Cleon, mature Lysander, teen Philip II. notable peasants from the Attica (surroundings of Athens). Yes. It takes a good story. Engaging, credible, precise, funny at times, dramatic at times, with memorable moments, as well as memorable dialogs. SPA will be our first movie, but not our first popular media work. Kirsten Dirksen, cofounder of this project along with Nicolás Boullosa, is responsible for a YouTube channel with over 180,000 subscribers, over 75 million visits. We plan to create/manage the movie as a “lean startup”. We do have experience in startups. It is low. The crew of SPA will be lean and will raise additional venture capital if needed. Venture capitalists will also own a stake of the film and derivative rights. The project will be coordinated by Kirsten Dirksen and Nicolás Boullosa, though a board will be created, composed by cinema, history/philosophy, media, and technology specialists. Socrates, Plato and Aristotle are only “too intellectual” when not properly projected/explained. This movie will make you think why you are not cultivating either your own coherent philosophy of life. Some of the best and most popular books and movies carry a lot of the philosophy this drama explores. Philosophy is not boring. Whoever explains philosophy without the ability to raise interest in any of the three philosophers involved in the plot, is boring. We’ll take the liberty to respectfully and realistically invent the plot and the dialogs, even though most key moments and dialogs will be based in facts accounted by philosophers and historians from the period, as well as from Roman times. For example, what we know about Socrates is explained by his disciple Plato in his works. 8. Will there be action? Yes. The best action is the one that suggests, comes by surprise, builds up without the need of create a neverending, noisy, loose concatenation of violence. 9. Will there be deep knowledge? Yes. Deep knowledge can be suggested as well once a credible universe has been created, this “framework” has its own life (the same way a good book, a good TV series or a good videogame does). 10. Could you explain some “peak moments” in the movie by relating it to memorable moments in existing movies? Can you evoke some of these movie moments?